Who asked you to come here? Two sisters came to seek our help. Younger Sister was diagnosed with breast cancer and had undergone a mastectomy. She was then asked to go for follow up treatments — 6 cycles of chemo and 26 sessions of radiation. Then she needs to take tamoxifen for five years. Younger Sister lives in Hong Kong and she does not know what to do next. She decided to come to Penang and ask our opinion. As usual, my first question is: Who asked you to come and see us? Younger Sister: My mom used to see you! Elder Sister explained: About 15 years ago, I came to see you with the medical reports. My mom didn’t come. My mom consumed your medication for like a year. She is still alive until today. She is 85 something now. (Note: Mom had breast cancer when she was 69 years old). A few days after the above episode, another two sisters came with their mother. Chris: You are from Medan. Who asked you to come here? Daughter: A relative. She came here for her treatment. Now cured! C: You know her personally? D2: Praise God she is cured! C: And she is still alive? D: About two years ago. At CA Care — sometimes the morning is most depressing — to see how patients suffer after all the treatments that they had gone through — but sometime it could be a blessed morning, knowing that some patients benefited from our therapy. When we first started CA Care in 1995, we were confronted with strong opposition that herbal therapy is just quackery! Not proven, not scientific. If at all there is good result, it is due to luck. We have come a long way since this video was broadcast live over the national TV in 1999. Over the past twenty plus years, I have produced almost a thousand videos in YouTube and written over seven hundred case studies to show that the results we achieved are real. Herbal therapy is not quackery! To me, it is all about God’s blessing. 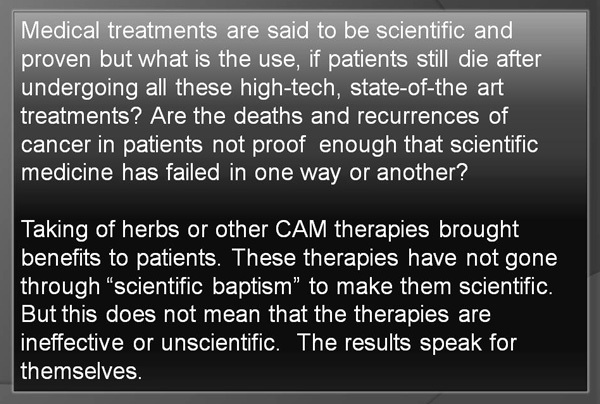 This entry was posted in Advice to Patients, Breast Cancer and tagged belief, herbal therapy by CA Care. Bookmark the permalink.